The layout of the building and the relationships between various functions and spaces, the way internal functions are accessed and consideration of neighbouring properties are all key aspects of the design and as such have been carefully considered. The scheme comprises of a 25m six lane competition pool, 150 spectators, training pool, wet changing village, 120 station gym, dance studio, 4 court sports hall, community room and members dry change. Great care has been taken to step the building down in scale toward the rear of the site to reduce its massing and to also reduce its impact on the neighbouring houses. The open parking area off Station Road offers separate Access/Exit and the one-way solution assists with the flow and is clear and easily used by the public. Direct pedestrian priority access through the Car park from the enhanced Bus stop which has been extended and reconfigured to provide a large Coach Drop off with the existing bus stop moved further along Station Road. The building is designed to be approached off the corner of Station Road and the existing pedestrian link where the main aspect is most visible. On approach the visitor arrives in an access controlled area in a large community viewing area/café and are welcomed by the dual reception and cafe servery where access is then provided to the facilities. The layout of the building and the relationships between various functions and spaces, the manner in which internal functions are accessed and consideration of neighbouring properties are all key aspects of the design and as such have been carefully considered. 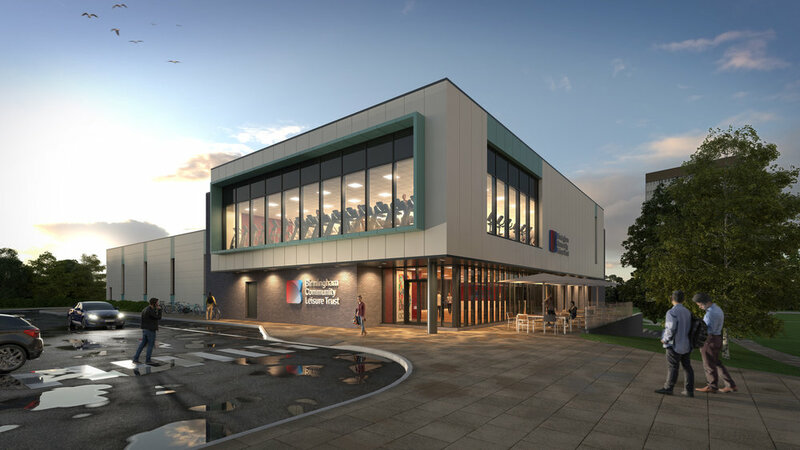 The scheme comprises of a 25m six lane competition pool, 150 spectators, training pool, wet changing village, 120 station gym, dance studio, 4 court sports hall, community room and members dry change.